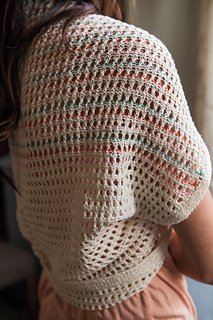 Interesting rectangular construction and subtle, beautiful use of color make this shrug a sure-fire win. Wear it to an elegant affair, or dress-up a casual look with this impressively simple knit. Yarn: Shown in Knit Picks Lindy Chain: MC Swan 26447, 3 (3, 4, 4/ 4, 5, 5/ 6, 6, 6/ 7, 7, 8) balls; C1 Blush 26464, C2 Conch 26463, C3 Sagebrush 26461.